What Is List Building All About? As part of the Ultimate Blog Challenge, I have decided that I am going to start a new mini-series where I am going to teach you how to help your business grow with a classic marketing strategy: list building. You have surely heard about how growing a big list of potential customers that you can get in touch with can benefit your business, but what we’ve found is that most experts have a hard time explaining what exactly list building is all about, so here I am, grabbing you (gently) by the hand to teach you how to do list building the easy way in 2019 and beyond! So What Is List Building All About? When it comes to online marketing, list building almost exclusively refers to the practice of growing and nurturing a list of email leads that can be engaged and converted into customers with a well-designed sales funnel. These lists can be segmented into different stages of the customer journey, and they can be built by using different lead generation strategies designed to capture email leads on a website. The most common strategy is to use opt-in pages featuring a free download that users can access after giving away their email addresses, but there are many ways to optimize and repurpose this strategy, as well as other high-converting strategies, and we are going to teach you how, the right way. 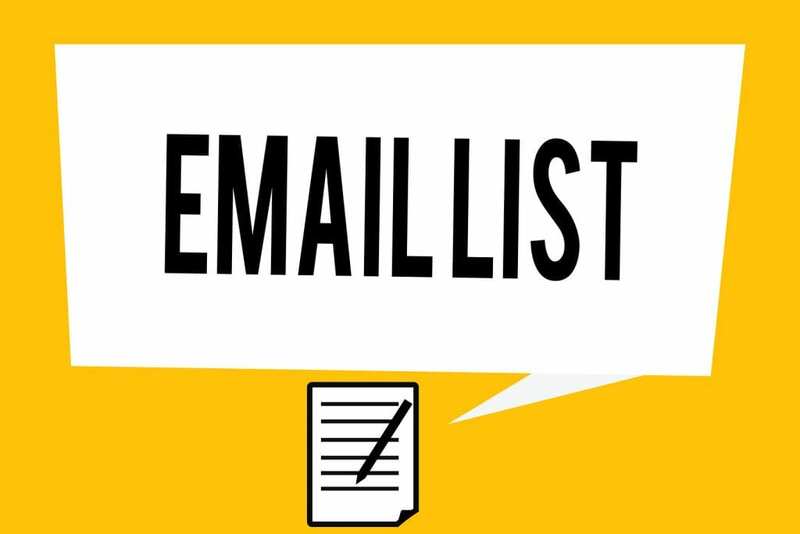 List building is a form of permission-based marketing, which means that you need to have permission from leads to add them to their lists, as well as permission to send them marketing messages and advertising. So when leads sign up to your email list to get a free download, or to get access to more content, they agree to be added to your list and to receive marketing emails from you or from your business. Why Is List Building Important In 2019? The goal of adding many people to your mailing lists is to create long lasting relationships that you can nurture to grow your business. With list building, you will be able to engage people who subscribe to your lists with exclusive content, offers, giveaways, discounts, and whatever incentives that can help you to convert them into repeat customers, right in their email inboxes! It’s been found that only 2% of website visitors convert into customers on their first visit. That means that only 2% of your own website visitors will be fine with going to your site and buying something if you’re lucky, but what happens after they buy? They might never come back. Worse still, what happens if they just leave without buying? With these list building strategies, you’ll learn how to easily capture website leads even if they land on your site by accident. You’ll also learn to capture email leads outside of your site the right way, so get ready to jumpstart your list building efforts for 2019 and beyond starting in the following lesson! After you leave a comment below, you can continue with this series, by reading Social Media Tricks To Grow Your List. Glad you’re up and running. Oh the ironies of life! I clicked on this because I love lists and my husband really loves lists. I see it’s business application but life has need of lists, too. I’m so glad you worked out your glitches. Thanks, Bonnie. I had a little glitch with some outdated software on the site which prevented the editor to work on my site and I was unable to post! Glad it is fixed! And thanks for popping in and commenting. That’s great, Paul! I’m excited about your series. I need help with getting people to sign up. People are coming to my website, but so far, no one is signing up for my freebie. Looking forward to your having some tips, tricks and ideas that will help, as part of this series. If you have traffic, and not a lot of sign-ups, it may be your offer… Try changing it up and seeing if you get more takers with something else. This is one thing I am lagging behind on – list building actively.. I am looking forward to your series..
Paul I like how you have defined list building, what it is, and why it needs to be done. Having a dedicated area to stay in contact with those who are specifically interested in what you do is a key ingredient for marketing your business and also for building a relationship with those on your list. I have a list, now I am working on my list to become a “responsive” list. Excellent, Livvie! It does not matter how big the list is, it is all about how responsive they are! I can’t wait to see what you have to say about list building. I am the email marketing content, queen but building lists has always been a challenge. Looking forward to learning from you. Keep coming back, Elisa! More is coming! Buying the books is a start, Roy. Do you have any follow-up emails for your services? Thanks for the info Paul. Looking forward to upcoming lessons. Give it a shot and see what happens, Carol! This is some great information. Thanks for sharing.